In the framework of the feasibility study "Inspection of Concrete-Embedded Tracks" between BAM and Deutscher Bahn AG, application and further development of NDT- measurements for the constructional conditions of the concrete-embedded tracks are investigated. After first test series on the rail track [Ref 1] and in further laboratory investigations on test specimen [Ref 2], result of the three selected non-destructive methods impact- echo, ultrasonic-echo and impulse radar will be presented. The constructional conditions of the concrete-embedded tracks are determined through visual inspection. However, some subsurface defects (e. g. voids, delaminations etc.) change the surface appearance or reach the surface only after a long period of mechanical load and weathering. At this time the defects are irreparable and the period of warranty is elapsed. Therefore strong needs are apparent to develop technical procedures for non-destructive testing (NDT). In the last decade there was a considerable technical progress in the application of NDT procedures in inhomogeneous materials, e.g. reinforced concrete and bitumen. Due to the fact that these are exactly the components of the concrete-embedded tracks the Deutsche Bahn AG has an increasing interest to use NDT procedures for quality assurance. In a joint project of the BAM and the DB AG test of NDT-measurements had been carried out in the route network of the railways with concrete-embedded tracks. Three NDT-procedures ultrasonic-echo, impact-echo and ground penetrating radar have been applied. The goal of this research was to be determining if such an inspection permits a sufficient evaluation of the track condition. In this paper results of the project "inspection of concrete-embedded tracks" are presented on the basis of selected examples. They show a combined application of the three testing methods during inspections on the track and on test specimens in the laboratory. The NDT-measurements in this project had taken place at a new concrete-embedded rail track with two block sleepers (System Rheda2000; Figure 1) and at a test specimen (also system Rheda2000; Figure 2). Fig 1: New Concrete-Embedded Rail Track with the two block sleepers type B 355 W 60M-BS (Rheda2000). Fig 2: left: two block sleepers type B 355 W 60M-BS right: The test specimen (Rheda2000). For the rail track measurements ten sections with each ten sleeper have been fixed. So that100 sleepers from ten different design states are evaluated. When data are collected in discrete steps along measurements lines, data can be plotted as 2-dimensional images such as frequency series and impact-echograms. These represent 2-D sections through the tested element, plotting the frequency amplitude as wiggle plot or in grey scale [Ref 5, Ref 6]. They have on one axis the position of the testing unit on the concrete surface, and on the second axis the measured frequency (or calculated depth). Fig 3: Measurements on track with the modified commercial impact echo testing system (Olson Instruments Inc. IE1, 1998). The impact echo measurement had been carried out with a modified commercial impact echo testing system (Olson Instruments Inc. IE1, 1998). The stimulation is realized through an electromagnetic forced steel impactor, a hemisphere plate with three millimeters diameter. Each signal of a point measurement is build up by 2048 data points in time frame of 13,61 ms with a sampling frequency of 150375 Hz. The minimal frequency resolution is 73,2 Hz. The distance between impact point and Sensor is 4 cm; the coordinates of a measurement point are localized by the sensor position. 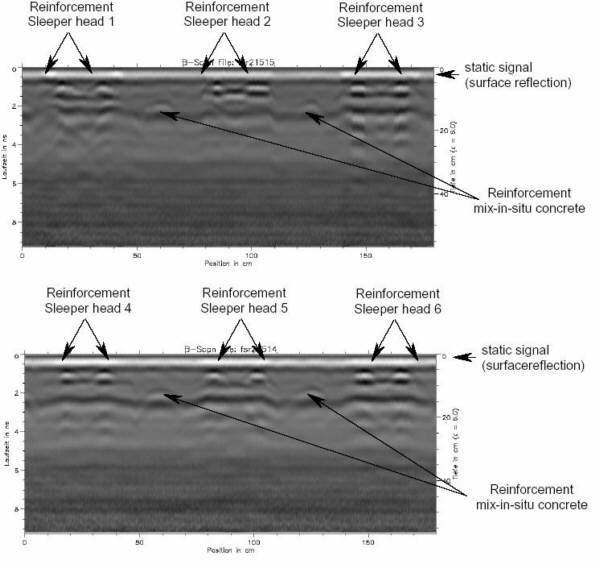 Fig 4: impact-echogram (B-Scan) from track measurements, left: sleeper correct implementation right: irregularities below the sleeper. In each measurement section ten sleepers have been tested, whereas at each case two measurement points are placed on the sleeper and two on the mix-in-situ concrete between the sleepers. At special chosen sleeper also grid measurements with 3 x 3 measurement points, for more detailed investigations. The measurement on the test specimen with the modified commercial impact-echo testing system was arranged analogous to the measurements on the track. Fig 5: Results of impact-echo measurements on test specimen-concrete-embedded tracks "System Rheda2000". The analysis of the measurements are visualized with 3D-analysing software (BAM development) in impact-echo-B-scans (vertical) and quasi horizontal sections, so called impact-echo-C-scans (middle of Figure 5) . For the area scans a grid of 2 x 2 cm was chosen, whereas in all measurement lines two measurement points are located on the mix-in-situ concrete. The different test conditions could be characterized by the backside echo at 8,3 kHz. Especially the fully bonded railway sleepers (2,4; Figure 5) show a clear reflection peak at the backside (horizontal black line). The debonded railway sleepers (1,5; Figure 5) show in contrast a significant shift the backside echo. The railway sleepers with lateral delaminations have only minor changes of the reflection from the backside echo. The characteristic line at 20 kHz is a system artefact. The ultrasonic-echo method is based on the time-of-flight measurement of short ultrasonic pulses. Fig 6: Commercial low frequency ultrasonic measurement system (A1220) left: measurements on track right: the system. The measurements have been realized by a commercial low frequency ultrasonic measurement system (A1220), with a working frequency of 55kHz. The measurement device A1220 (Figure 6) depends on measuring with point contact, shear wave transceivers array, where no coupling medium is needed. The measurement data are visualized in B-scans (for example see Figure 7 & Figure 8). The evaluation of the acoustic contact between sleeper and mix-in-situ concrete depends on different criteria of appearing or not appearing reflection signals. For clarification in Figure 7 the extreme cases of good acoustic contact (left) and poor acoustic contact (right) are shown from the measurements on the track. 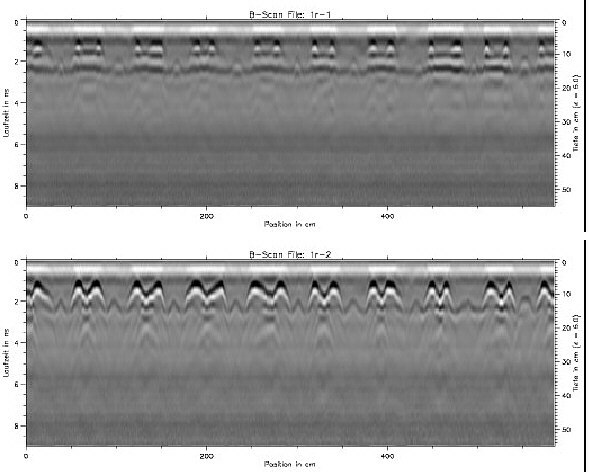 Fig 7: Ultrasonic B-scan from track measurements of left: sleeper with good acoustic contact and right: sleeper with poor acoustic contact. Fig 8: Ultrasonic B-scan from test specimen measurements of left: sleeper head 2 (good) and right: sleeper head 1 (poor). Criteria for a good acoustic contact are, if there is a backside echo from the sleeper (at 8,5 cm) and the mix-in-situ concrete (at 24 cm) or from HGT (at 54 cm)(Figure 7, left). Figure 7(right) shows a sleeper head with a poor acoustic contact. The criteria of evaluation are the existent multiple reflections. The multiple reflections are caused by horizontal and lateral natural oscillations of the sleeper head. The assumption is that the sleeper head is detached and these distinctive features in the ultrasonic B-scan appear in multiple reflections. The measurement on the test specimen with the low-frequency ultrasonic instrument AS1220 was arranged analog to the measurements on the track. The measure grid consists in 4 measure lines with a distance of 2 cm per measure line and point (Figure 7). It results in 40 measure positions, comparable with the result of the track measurement. The results of these measurements are visualized in ultrasonic B-scans and the evaluation of the acoustic contact runs also trough the criteria of previous evaluation. Figure 8 (right) shows clearly the backside echo of the sleeper head in 8,5 cm depth. The existing multiple reflections indicates the poor bonding of the sleeper head to the mix-in-situ concrete. In comparison to the detached sleeper head in Figure 8 (left) the multiple reflections are absent. The existing backside echo of the mix-in-situ concrete indicates a good acoustic contact. The principle of radar is based on the radiation of very short electromagnetic impulses (< 10 ns), which are reflected at interfaces of materials with different dielectric properties. For applications in civil engineering, usually frequencies from 500 MHz to 2.5 GHz are applied via bow tie or horn antennas [Ref 7, Ref 8, Ref 9]. When the impulses are emitted, transmitting and receiving antenna are in contact or at a constant distance from the structure surface. The propagation velocity v through the materials as well as the reflection coefficient R at material interfaces (as in the case of different layers, air voids, water inclusions, reinforcement and other inhomogeneities) can be expressed by the following equations. The reflections recorded with the receiving antenna by moving both transmitter and receiver along a pre-defined line on the surface can be visualised as 2D images or radargrams, where the intensity of the reflected impulses is displayed in a grey scale. Fig 9: Measurement system (left), Measurement with the 1,5 GHz antenna (right) on track. The commercial radar equipment SIR 10A with a 900 MHz and 1,5 GHz both from the GSSI company (USA; Figure 9) was utilized for the realization of the radar measurements in the track section of the new developed railway. An impeller was mounted on the antenna to trigger the measurement and map the route, whenever the required space was sufficed. During the measurement the utilised antennae were in contact with the surface of the roadbed. All radargramms (Figure 10) show in the area of the sleeper head, the overlap of the sleeper heads backside with its reinforcement. Fig 10: Example radargramm of a measurement section from track measurements with the 1,5 GHz antenna over 10 sleeper heads. upper: parallel arrangement of the polarizations direction and the moving direction of the antennae, lower: vertical arrangement of the polarizations direction and the moving direction of the antennae. The reinforcement of mix-in-situ concrete - running transverse the measurement - emerges definite by vertical arrangement of the polarizations direction and the moving direction of the antennae. But also in this direction of measurement it is impossible to say anything about the fitting condition of the sleeper heads. The surface of the test specimen (static signal) emerges in a horizontal running reflection strip in both radargramms in a depth of 0 cm (Figure 11). More definite reflections appear alongside the area of the sleeper heads. These reflections are superposed by the backside reflection of the sleeper head and the reflection of sleeper reinforcement. But on the basis of radargramms only, it's impossible to differentiate a sleeper head with a good bond to the mix-in-situ concrete (sleeper head 2 and 4) to a reduced bonding sleeper head (sleeper head 1 and 5). Fig 11: Radargramm measurement lines over the sleeper heads of the test specimen, recorded with the 1,5 GHz antenna in parallel arrangement of the polarizations direction and the moving direction. The results of laboratory investigations show that it is possible to distinguish between a correct and a fault/defect condition. The measurements on a railway line indicate a variety of built in implementations. This joint project demonstrates very well the practicability of a combination of the NDT-methods impact-echo, ultrasonic echo and impulse radar for the inspection of concrete-embedded tracks. Now the goal must be to transfer the results to practical application, which can be used as a commercial standard inspection of concrete-embedded tracks.